By nature, the success of an association is tied to how well it interacts and communicates with members. To learn how the top professional and trade associations in the U.S. keep thousands of members engaged on Twitter, Software Advice analyzed tweets and asked social media managers about their strategies. In this report, we reveal evidence-based best practices that other social media managers can use to develop high-impact Twitter campaigns. A combined 91 percent of survey respondents say Twitter engagement is positively impacted when their content strategies are informed by data. Eighty-four percent of respondents use general-purpose software, such as Microsoft Excel, to organize and analyze Twitter engagement and member data. 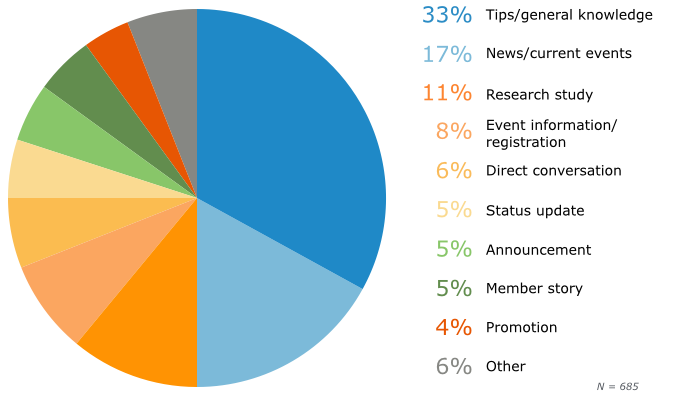 One-third of tweets are comprised of tips and general knowledge on topics relevant to association members’ professional interests. Promotional content is minimal—only 4 percent of tweets contain discounts or other messages prompting a member to make a purchase. Sixty percent of association managers publish an average of two to five tweets per day to increase reach and engage members everywhere. Members are the heart and soul of associations, and a pursuit of knowledge is one factor that motivates people to join. As such, how well social media and community managers facilitate knowledge-sharing is what many people use to measure the value of their membership. When used correctly, Twitter is one communication tool that is effective in distributing information and engaging members online. In fact, according to The Center for Association Leadership, 74 percent of association managers believe that integrating social media with other marketing activities is “important” or “very important,” and social media marketing is their second-highest budget priority. Adam Kearney, director of marketing for software company MemberClicks, says successful member engagement on social channels requires mastering engagement on other online and offline channels, such as member communities, events, discussion forums and blogs. So, what do you do when you’re ready to tweet? To start, find what resonates with your constituents by letting data inform your association’s Twitter communication plan. Survey respondents agree that using data to develop a Twitter strategy has a positive impact on member and follower engagement: a combined 91 percent describe the impact as “somewhat” (52 percent) or “very positive” (39 percent). Elizabeth Bookhultz, social media administrator for the American Society of Civil Engineers (ASCE), uses data to ensure that her team is listening to the interests of its 24,700 followers. She compiles this report manually, with some of the data coming from Hootsuite, the association’s social media management software (more on this below). 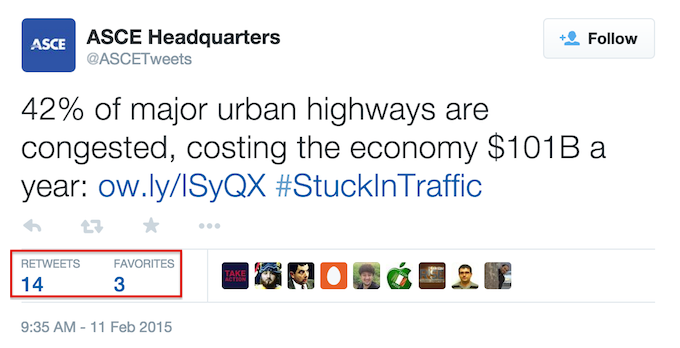 For example, Bookhultz noticed that ASCE’s audience of data-loving engineers are inspired to engage by retweeting when a post includes statistics or hard numbers. Now when she composes tweets, she distills content down into its most interesting figure. This data-driven approach, she says, has helped her optimize the reach of ASCE’s content and overall member engagement. 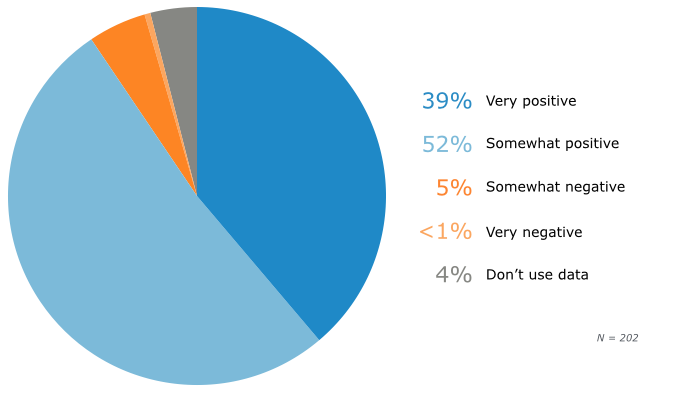 Going back to our survey results, fewer than 6 percent of respondents say using data to develop a Twitter communications strategy negatively impacts its success. We did not ask respondents how or why they perceive a negative effect, but presume that analyzing the wrong types of data or making decisions based on incorrect conclusions are top reasons. For example, small data samples may not accurately represent an association’s entire audience. Doubling down on a tactic to increase engagement based on conclusions drawn from the small sample runs the risk of alienating the larger audience, resulting in an overall negative effect. Finally, only 4 percent of respondents say they engage members on Twitter without using any data to form a communications strategy. Survey respondents use a variety of methods to collect member and social media engagement data. The most common one among our sample is general-purpose software, such as Microsoft Excel (84 percent). Thirty-three percent also rely on specialized software, such as an association management system (AMS) that organizes member demographic, activity and interest data, or a stand-alone social media management solution (e.g., Hootsuite or Spredfast). Finally, one-quarter of respondents use manual methods, which include written feedback and member surveys. Twitter provides basic reach and engagement data, including the number of times a tweet is shared (known as “retweets”), which is useful for assessing general member involvement. But without specialized software, it is hard to obtain cross-channel data for a complete view of how content shared on Twitter impacts a member’s interactions on other channels, such as the association’s website, Facebook or LinkedIn. Association management system. An AMS with social media integration tracks what content a member shares on Twitter. Social media management software. This application lets managers schedule future tweets and calculate reach. Website analytics. A Web analytics program—like Google Analytics—collects data for assessing member engagement. For example, Bookhultz is currently working to expand the types of data her organization collects so she can see what content leads to revenue-generating conversions, such as members signing up for an event. Without using analytics tools that track URLs—in this case, Google Analytics and Hootsuite—it would be difficult, if not impossible, to gather this information. Sources we spoke to also stress that while software is essential to organize data and automate content publishing, it does not replace the need for a knowledgeable person to scrutinize the data and glean actionable insights. In other words, software can support data collection and measure results, but human brainpower must formulate the strategy. Twitter is a content waterfall, metaphorically speaking. To be noticed in a rapid stream of tweets, social media managers must publish exactly the content followers want in a package that catches their attention. In our sample, the type of content shared is primarily tips and general knowledge that benefit members’ professional goals and challenges (33 percent). This is followed by general or association-related news and current events (17 percent) and relevant research studies (11 percent). T.J. Doyle, director of social media for the National Association of Realtors (NAR), says the organization’s social media strategy has evolved from a “one-way push of information to a two-way conversation,” where engagement with NAR’s 183,000 followers is the priority. One tactic Doyle employs to support this transformation is what he calls the “70-20-10” rule. 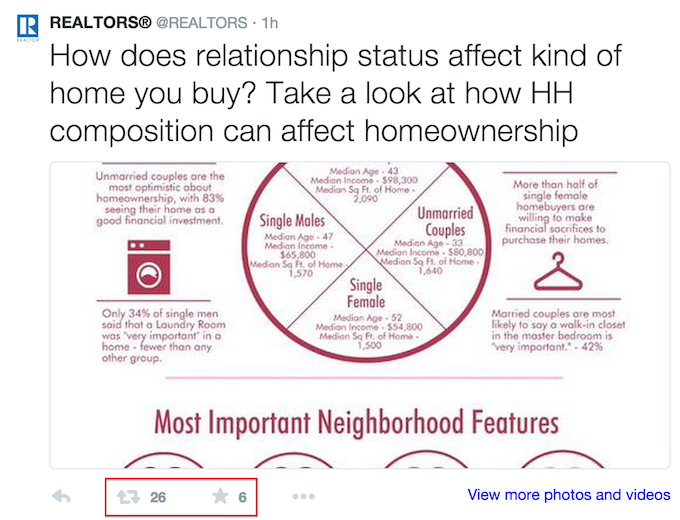 “About 70 percent of our posts share content that educates our audience, builds value and supports NAR’s brand, 20 percent is content from external sources and 10 percent is promotional,” Doyle explains. No matter what the type of content, Doyle includes statistics and visually appealing assets whenever possible to boost the content’s shareability. Dana Rehm, director of marketing for the American Geophysical Union (AGU), says her team also keeps promotional tweets to the association’s 28,800 followers to a minimum. Search Google for information on “when to tweet,” and you’ll get 691 million matching results—clearly, much has been researched and written on this topic. We wanted to know how frequently associations post on Twitter. According to our sample, 60 percent do so between two and five times each day. Larry O’Hanlon, social media manager and science writer for AGU, has a simple philosophy on how often social media and community managers should tweet: Unless you see a negative consequence to it, then post frequently and on an ongoing basis. “We don’t have a maximum limit on the number of tweets we post per day, but we do have a minimum limit of 10 to 12 for our newer, discipline-specific accounts that don’t yet have the high engagement level and number of followers we see on our main account,” explains O’Hanlon. While Rehm and O’Hanlon are not concerned with how often tweets are posted, they do take into account AGU’s worldwide audience, and post content around the clock to engage members everywhere. “After the U.S., the next largest percentage of our followers reside in India, so I generally post more than once at different times throughout the day so that our content appears at the top of the stream for people in multiple time zones,” says O’Hanlon. Doyle also posts content more than once per day to maximize its reach. “I’ll often repackage a post to highlight a different nugget of information later on, and the most popular posts get reused frequently over a couple days,” he says. Based on our analysis and advice from sources, we identified steps social media and community managers can follow to develop and continually refine Twitter content publishing plans and increase member engagement. In addition to the steps outlined in the chart above, aim to publish content that members find most valuable—a combined 50 percent of tweets in our sample shared useful tips and important industry news. Finally, post frequently, taking into account where your members reside in order to schedule posts to publish when most are online. Sixty percent of associations in our sample post at least two to five times per day, but our sources say you can post much more frequently as long as there are no negative effects. Because Twitter’s platform is easy to learn and its posts are short, one might assume that engaging members on it is effortless. But as with any communication tool, a thoughtful plan combined with the right technology is crucial to use it effectively and develop an engaged community of members and followers who value the content you share. Associations should look at member data and engagement metrics, as information provides insight on what your members and followers want to know. It’s also important to continually measure results and make adjustments along the way. AMSs and social media management applications automate publishing and data collection, which can make this type of analysis easier. More basic tools, such as spreadsheet programs and the Twitter platform itself, are also useful for organizing data in order to identify patterns and measure results. And of course, human brainpower must tie it all together by formulating a strategy your association can execute on. To find the data in this report, we used Guidestar and other public information to create a list of large associations, then screened our sample to include only those that engage members on Twitter. We then collected four weeks of tweets from 50 large U.S. professional and trade associations. Additionally, we surveyed 202 association management professionals from all sizes of associations who are responsible for determining social media strategies. 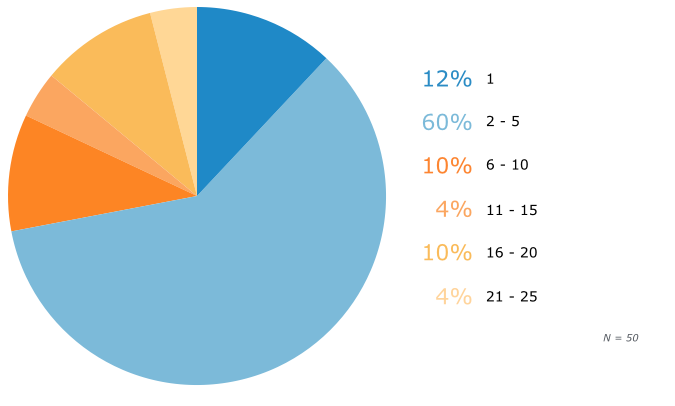 Survey respondents may or may not represent associations with tweets included in our analysis. Software Advice performed and funded this research independently. Results are representative of our survey sample, not necessarily the population as a whole. Sources attributed and products referenced in this article may or may not represent client vendors of Software Advice, but vendor status is never used as a basis for selection. Expert commentary solely represents the views of the individual. Chart values are rounded to the nearest whole number. If you have comments or would like to obtain access to any of the charts above, please contact janna@softwareadvice.com. 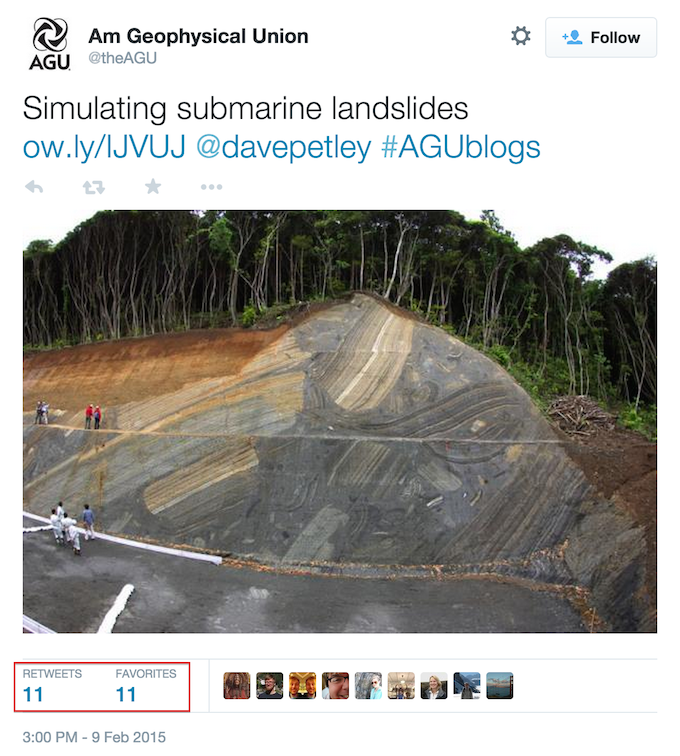 Image in AGU’s tweet by Zane Jobe.